A new breed of latest technology petrol driven vehicles has been clearly visible on the streets of London for the past year or so, following the decision by the City of London Police to use Nikkalite® Flexible Crystal Grade retroreflective and fluorescent liveries supplied by leading traffic and transport solutions provider Rennicks UK. One of the first vehicles to take on the fleet’s new way forward is the New Ford Mondeo Police Dog Section unit (pictured). 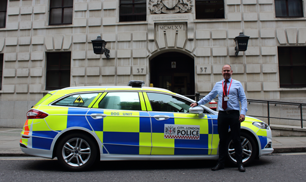 As part of the City of London Police’s programme to replace its diesel fleet with new, more environmentally-friendly and cost effective lower emission vehicles, the new fleet will feature enhanced liveries fully compliant to current standards and with excellent long-lasting retro-reflectivity at all angles. Already used on a number of emergency vehicle fleets around the UK, Nikkalite® Crystal Grade is a flexible microprismatic retroreflective sheeting designed for emergency vehicle liveries complying with the Home Office Scientific Development Branch High-Conspicuity Livery Specification PSDB 14/04. To find out more about Nikkalite® from Rennicks, call Nic Richell on 01928 579966. It is important to the effectiveness of the livery scheme that retroreflective materials of the highest available grade be used throughout.